For many of us growing up, the idea of becoming a millionaire would have seemed a pipe dream which could only be achieved by winning the lottery or coming into an unexpected inheritance from a long-lost relative. However, making a million from the markets is a genuinely realistic goal. In this article, we do the sums to show how, by using tax efficient wrappers and benefiting from the superior returns offered by stocks and shares, you might get to the £1m total from a standing start. The number of people with £1m in liquid assets like shares or cash savings is significantly smaller and this is an exclusive club worth joining, particularly if you want to enjoy a high standard of living in retirement. As well as exploring the monthly contributions required to hit a million within three decades we also look at how you might get to the more modest sum of £50,000 over a five-year timeframe. And we take a look at some potential investments which have delivered the kind of returns required to hit that seven-figure total over the long term. You might shell out £2 a week in the hope of becoming a millionaire by winning the National Lottery or even £4.50 if you play EuroMillions once a week too. Yet the chance of winning the National Lottery jackpot is one in 47m – you are almost five times as likely to be struck by lightning. If, instead of frittering away your £4.50 a week on lottery tickets, you put that money into the markets instead you could, based on a 7.5% return, build a healthy little investment pot of more than £25,000 over 30 years. According to stockbroker AJ Bell if you invest £12,600 – split as £7,000 in a pension and £5,600 in an ISA – every year for 30 years then, assuming a relatively conservative 5% investment return after charges and including the tax relief available on a pension, you would hit £1m in 30 years. 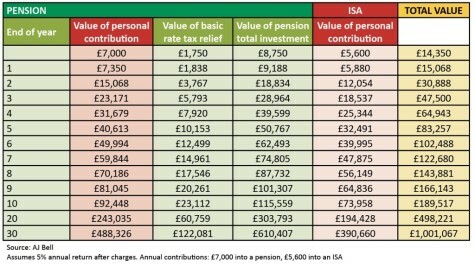 A little more than £0.6m would be in a pension with the remainder in an ISA account. This is a relevant consideration as you would pay tax on any income or withdrawals from your pension but not from your ISA. Dividing £12,600 into 12 equal chunks means you would be investing £1,050 per month which may be beyond the reaches of some people. However, a couple could split the contributions (such as £525 each) so the outlay would be more manageable. 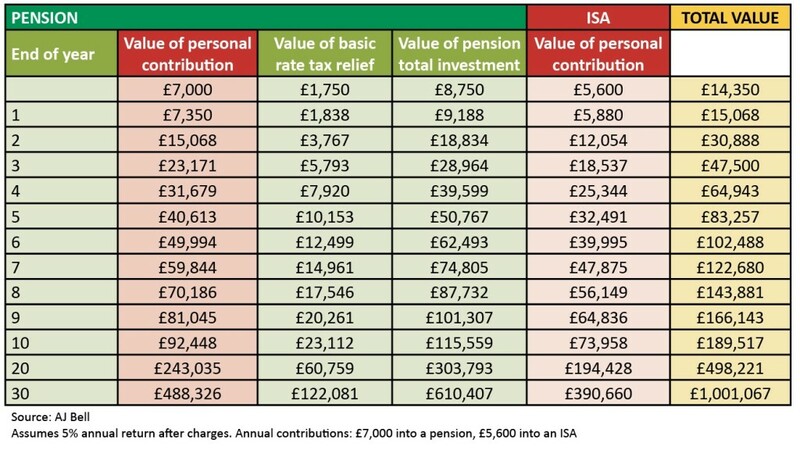 As an individual, if you want to get to £50,000 in five years then, at the same investment return of 5% and assuming the same split between your pension and ISA, you would need an annual contribution of £7,500 a year or £625 per month. 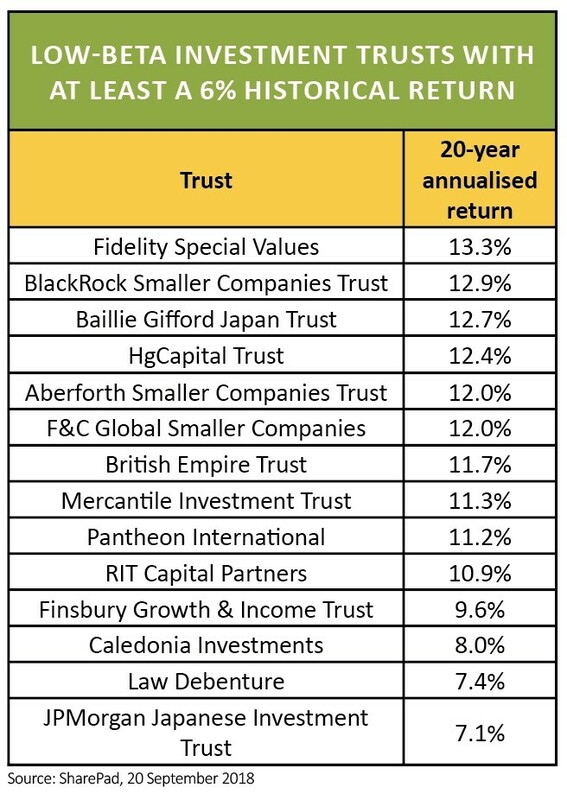 Investors who want to get to £1m in 30 years with a more modest annual contribution could consider taking on a bit more risk by targeting a higher return. If you achieved a 7.5% return after charges your annual contribution (as an individual) falls to a slightly more manageable £7,650 or £637.50 per month. For a couple the savings requirement would work out at less than £320 each per month. And arguably an investor or investors with 30-year time horizons can afford to take on more risk. 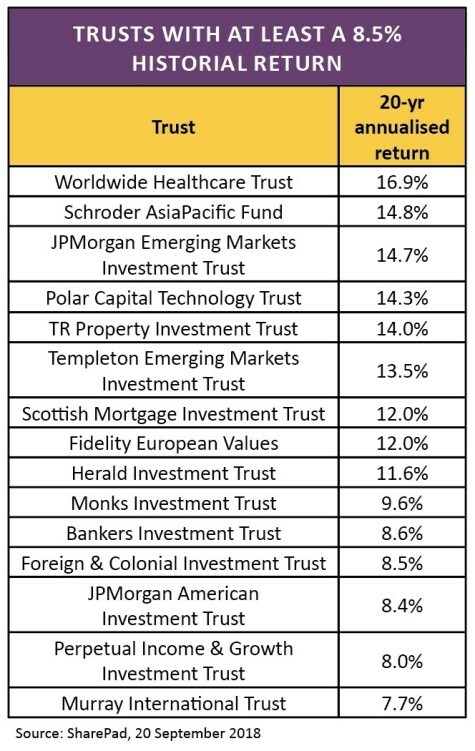 To achieve a total return of 5% after charges we are going to be conservative on the level of costs involved in investing and assume you need an annualised total return of at least 6% from your portfolio. 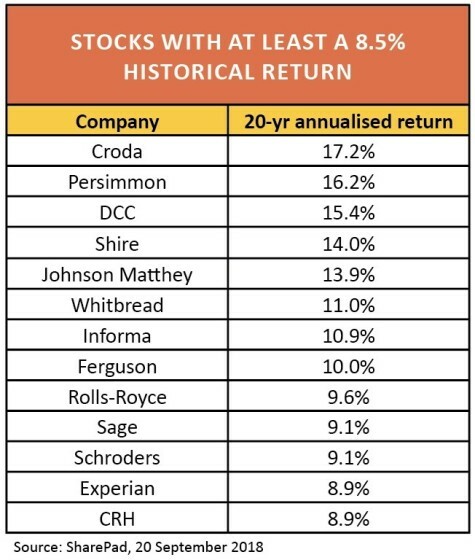 One way to look for potential investments that could deliver such returns is to analyse historical performance. 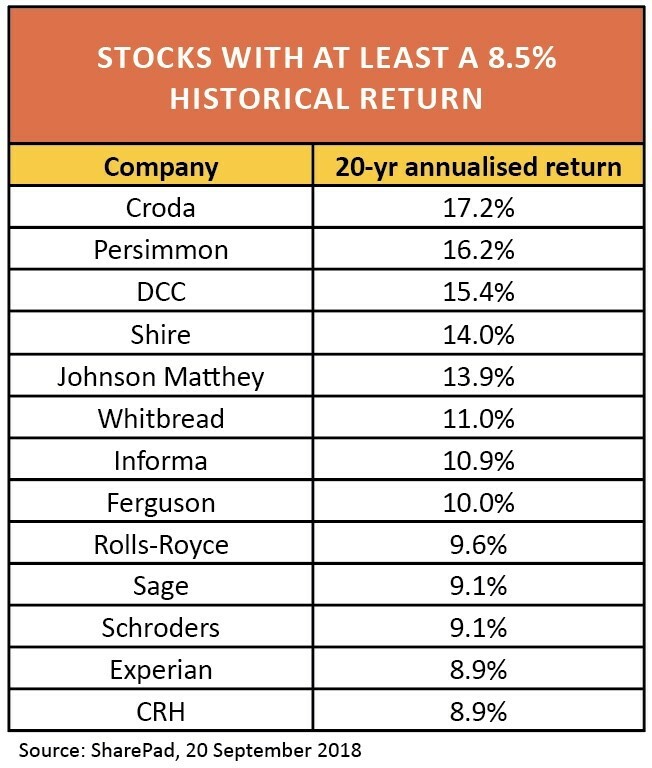 Yes, past performance isn’t always a guide to future performance, but it can be a good starting point for your research to spot companies which have a good track record of rewarding shareholders for a long time. We’ve run some data looking at the past 20 years on the markets. As part of our research, we have also included stocks with a 10-year monthly beta of less than 0.75 – in order to spot investments that might be more suitable for a less risk-tolerant investor. help protect your portfolio during periods of increased market volatility. Diageo (DGE) is among the names in the FTSE 100 which meet our criteria during the back test. It boasts brand strength, strong cash generation and progressive dividends. Also fitting the bill is health and safety specialist Halma (HLMA) for its regulatory-driven profit as well as business supplies firm Bunzl (BNZL). The latter provides day-to-day necessities which firms rely on, including everything from cleaning products to office supplies. Investors should note the inflation-busting income on offer from National Grid (NG.) which runs much of the UK’s electricity and gas infrastructure. 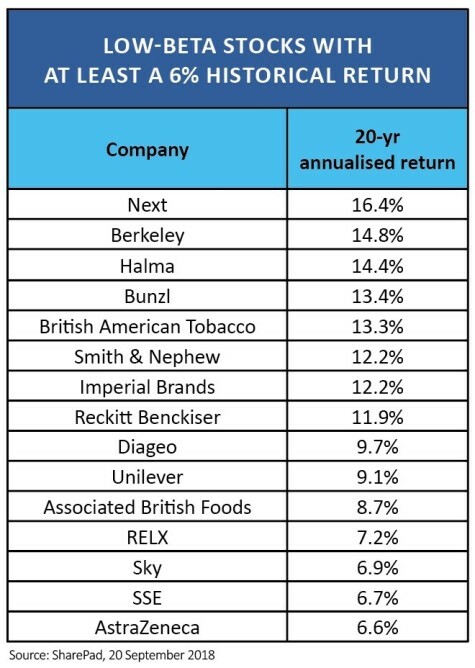 Unlike other utilities, such as SSE (SSE) which also makes this list of stocks delivering the required returns but isn’t a share we’d recommend buying, National Grid gets paid for use of this infrastructure rather than being at the mercy of wholesale energy prices or consumer demand. Some investors may prefer the diversification offered by investment trusts as an alternative to individual stocks and below is a list of larger trusts which have delivered annualised returns of 6% or more over the past 20 years, plus have low beta. Notable names include Fidelity Special Values (FSV) and Finsbury Growth & Income (FGT). 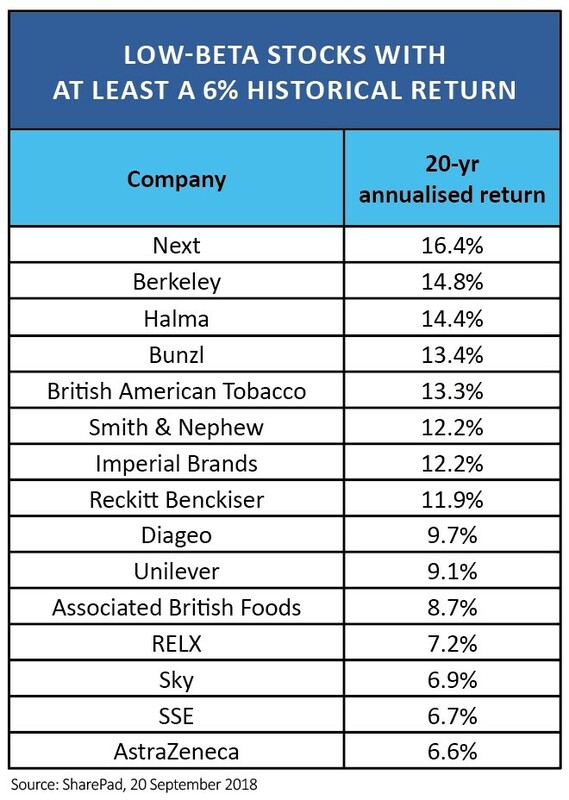 Widening our search to encompass FTSE 100 stocks which have delivered an annualised return of 8.5% or more (higher than the desired 7.5% as we are factoring in the costs of investing) over the past 20 years, we have also relaxed our beta criteria to include shares which have a 10-year monthly beta of between 0.75 and 1.5. The results of our search include chemicals firm Croda (CRDA). It has a large chunk of products being sold into a personal care market which, according to consultancy Euromonitor, is set to achieve around 4% compound annual growth over the medium term. Johnson Matthey (JMAT) is trying to capitalise on the expanding electric vehicle market plus it has a growing health business, while credit checker Experian (EXPN) provides services which are integral to day-to-day life. Companies like plumbing products firm Ferguson (FERG) and construction materials play CRH (CRH) have decent track records but are exposed to inherently cyclical industries.